British School Jakarta (BSJ) will implement IB Middle Years Programme (MYP) and IB Career-related Programme (IBCP) in August 2019. 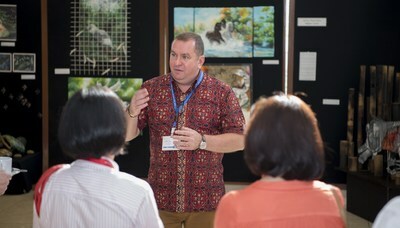 JAKARTA, Indonesia, March 15, 2019 /PRNewswire/ — The new British School Jakarta Principal, David Butcher, announced two new initiatives for the school’s curriculum framework, the International Baccalaureate Middle Years Programme (IB MYP) and the IB Career-related Programme (IBCP), starting in August 2019. The IB MYP is a curriculum framework designed for student aged 11 to 16, with an emphasis on developing creative and critical thinkers. British School Jakarta will be implementing the MYP as a three-year program, leading into the International General Certificate of Secondary Education (IGCSE). After completing this path of study, students are well prepared to undertake the world renowned pre-University qualifications, the International Baccalaureate (IB) Diploma Programme (DP) and Career-related Programme (CP). Centered on connecting students with society through the IB MYP, David is optimistic to consistently empower BSJ students to create change in the future. “It is incumbent on us to move forward, ensuring the school meets the educational needs of future populations. We need to develop the necessary skills, in our students, to nurture and challenge them to be their best, through the cutting edge of this new academic achievement,” said Butcher. The initiative now leads to a new BSJ collaboration with research scientist, Mette Boell from Massachusetts Institute Technology (MIT), who provided training and workshops for staff and students, as part of their Compassionate Learning Systems. The program is led by the world-renowned MIT lecturer Peter Senge, the founding chair of the Society for Organizational Learning. “Compassionate Systems represent one way to utilize the cognitive and affective aspects of the learner profile and the approaches to learning skills. Social and Emotional Learning (SEL), combined with an understanding of systems and complexity, can establish a cognitive and affective foundation for ‘international-mindedness’,” said Mette Boell. Founded in 1974, BSJ has educated a community of over 50 nationalities in Indonesia. The school consistently sends its graduating students to the best universities around the world, including, the USA’s Ivy league universities and the UK’s Russell Group.